All New GMX Blaide Dirt Bike 125cc is here to start up a sharp ride! The Blaide Dirt Bike is the new..
All NEW! GMX 125cc Dirt Bike with Genuine 125cc SHINERAY High-Performance Engine (4 Speed), has the ..
All NEW! 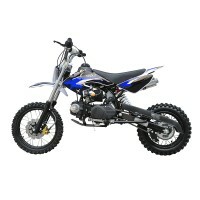 GMX 125cc Dirt Bike with Genuine 125cc SHINERAY High Performance Engine (4 Speed), has the ..